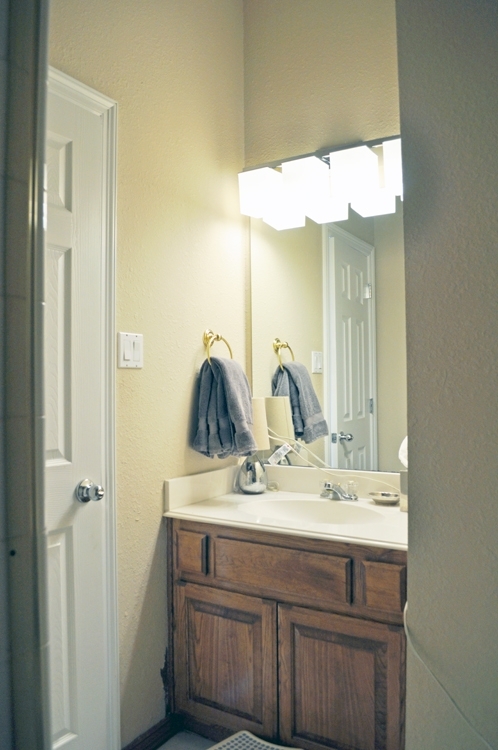 We have one final bathroom in our 1995 Fixer Upper that is original. I had planned on that being the case until we were ready to remodel the Kitchen & Laundry Room. But, I’ve changed my mind. Honestly, I can’t live with this fugly bathroom anymore. It’s driving me bonkers. 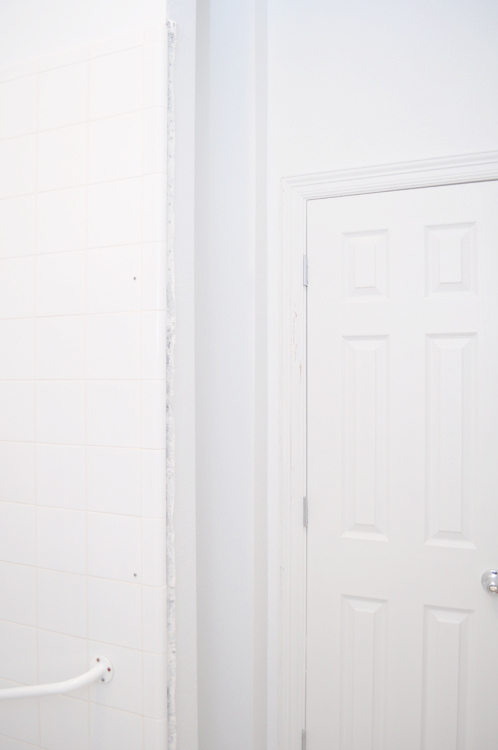 It’s time to do a total guest bathroom remodel. In the picture above, I’m standing in the doorway to the laundry room. The door to the left is the Guest Room. That area through the cased opening on the right is the breakfast nook & kitchen. 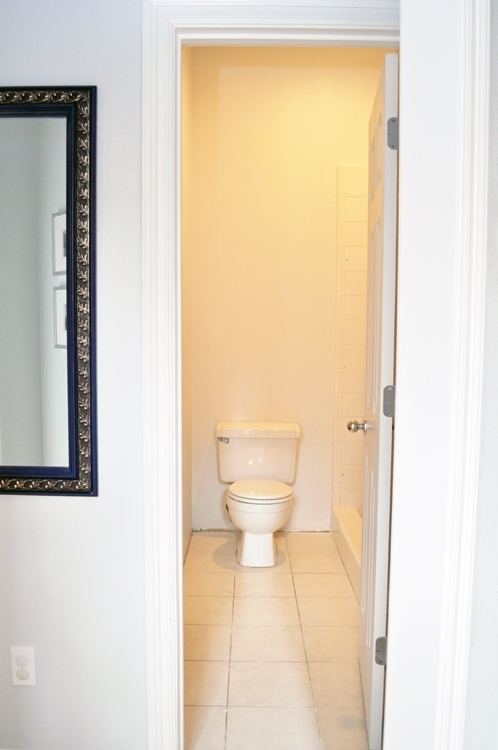 Finally, the door straight ahead is the guest bathroom. You can see the patio door in the mirror. Now that you’ve got your bearings, let’s take a peek at this monster. 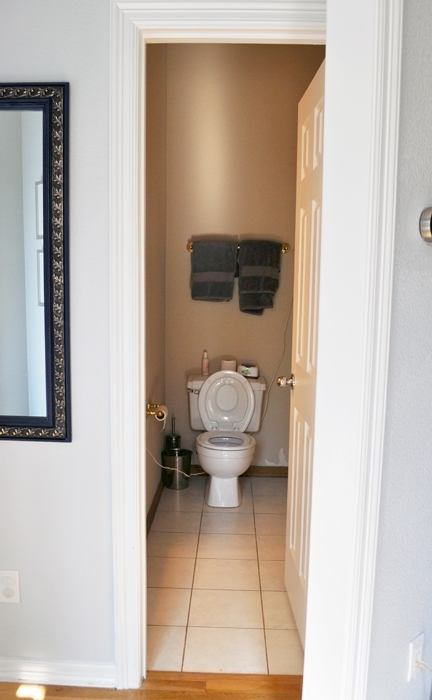 Because this bathroom is in very close proximity to those two rooms, I thought I wanted matching countertops in those rooms so they felt cohesive. That was one of the reasons we had been putting this off. But, I think I’ve come up with a solution, so its time to proceed with remodeling this bathroom. 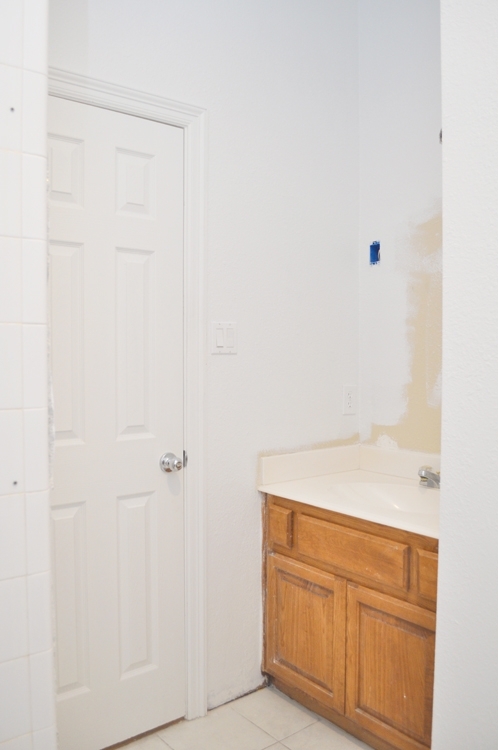 There are so many problems with this bathroom, that nothing but a complete redo will do any good. That’s probably why it’s been like this since we moved in. I could have painted, but what’s the point? That was my mentality about this room. 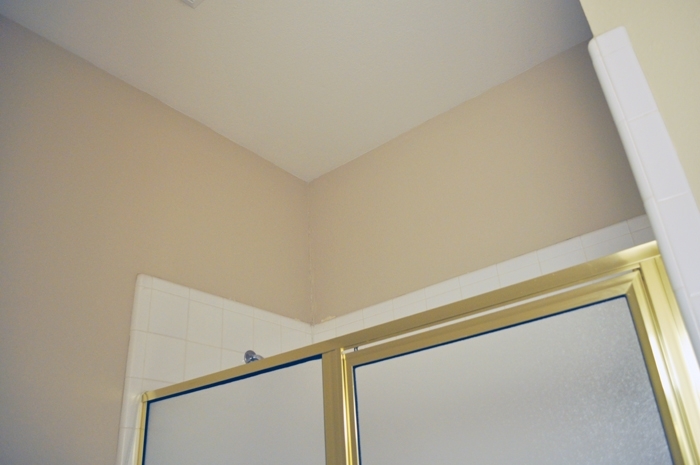 This is a really small and cramped bathroom, with very tall ceilings. It’s hard to get good pictures in here. The layout above is what we currently have, and everything is staying in the same place. We’re just replacing all of it. The first problem with this room is it’s really dark. There’s one light over the sink and no window. The ceilings are 10′, which is nice, but the vanity area is very narrow and the room feels cave-like. 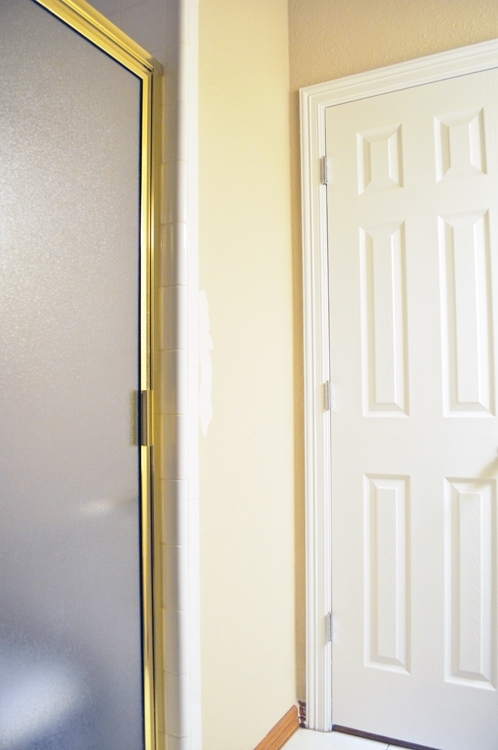 The shower is disgusting and leaking, and the shower door is outdated and cuts the room in half. The next huge problem is there is no storage. 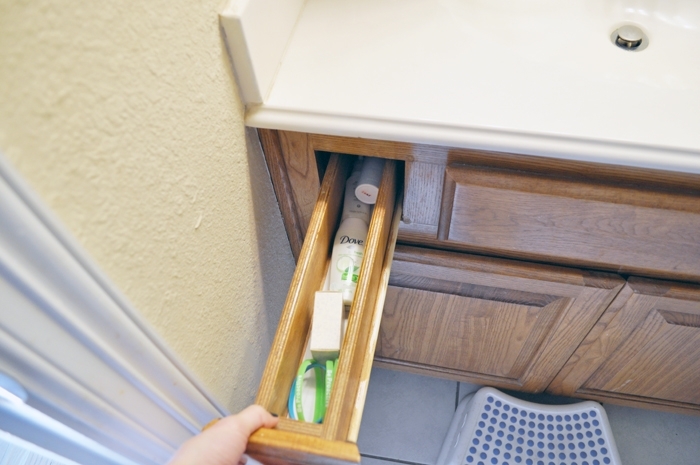 The vanity has useless skinny drawers on either side of the sink. There’s only one cabinet, and its half consumed with plumbing. All in all, it’s a weird and ugly room. Also, as you may have guessed from the interesting elements in the shower (and the random extension cord), Doug’s fermenting beer in the shower. Insert all the eyeroll emojis here. 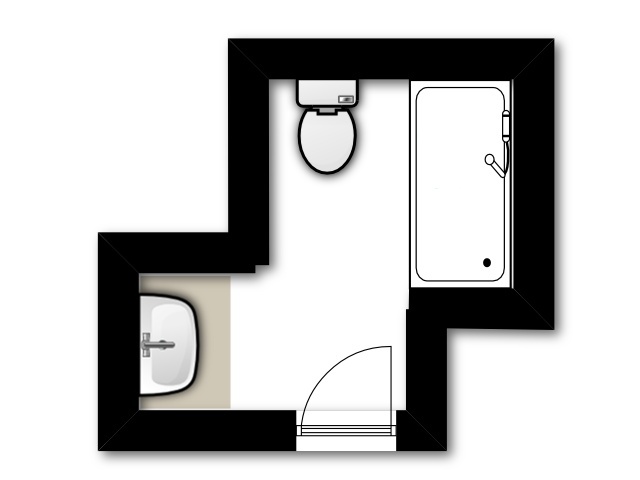 Any guest bathroom remodel project for this room has to address and fix all of those problems. I decided a while ago that I was going to paint the walls white to brighten it up, have Doug install 2 recessed LED can lights over the shower, and live with the rest. But then, I wanted to bust into the wall behind the door and build built ins for storage. 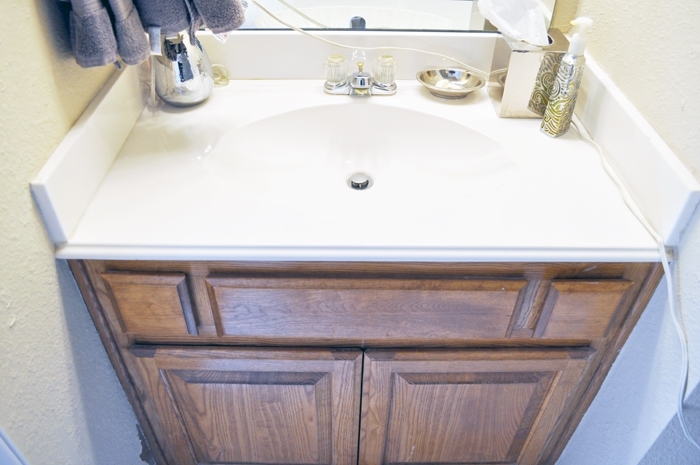 From there, I decided that the built ins should have stained wood shelves, and that I could easily (& inexpensively) build a floating vanity that matched them and put a vessel sink on the top. It started spiraling. I’ve gone ahead and got started on that stuff. I’ve already painted the ceiling & walls white. I used Benjamin Moore Decorator’s White for the walls, which is the color of the trim in the whole house. Also, Doug installed a can light over the toilet/shower area. We were going to do 2 can lights centered over the shower, like we did upstairs, but there was a ceiling joist running right down the center of the shower. So he centered it over the whole square that makes up the shower & toilet area. These two changes make the room feel so much brighter already. Like maybe I can finish the vanity & storage area, hang a pretty shower curtain, and not do a whole remodel. Nope. No I can’t do that. The floor, shower & toilet are totally gross and embarrassing! We also have built the alcove for the shelves. That’s easy enough! But what about the rest? Before, I had always wanted a bathtub in here, but I’ve now decided to keep the walk in shower. I don’t think a bathtub would fit through the skinny, 21″ door anyway. Since we’re keeping the shower, I want an ADA-compliant shower. We have a disabled family member, and I thought it would be nice to have a shower for her that was curbless to prevent tripping. It’s a big enough space that I think we can fit a teak bench in it so she can sit. I also am going to put modern grab bars in the shower & near the toilet for her to use. One of the issues that we have to address is the floor. Currently, the tile is directly on top of the concrete slab foundation of the house. However, just outside the bathroom door are nail down hardwoods that are about 3/4″ taller than the finished tile floor. We need to have a seamless transition from the hallway to the bathroom, so that means raising the bathroom floor to level with the hardwoods. The other issue is that in order to have a curbless shower, they’re going to have to remove some of the slab to get the shower pan low enough to handle the drainage. At least they won’t have to remove as much as they would have since we have to raise the rest of the room up a bit. To fix these issues, we’re going to leave the fugly shower, floor & toilet until we’ve done everything else. Then, we’re going to have a professional redo our shower and tile the floor. I don’t want to mess with a shower pan or tiling a shower alcove again. We did that with the kid’s bathroom, and its energy I don’t want to spend right now. Of course, if the bids are astronomical, we’ll be tiling this shower! Stay tuned! We bought some Maple Plywood to build the vanity and matching shelves. I’m going to use Minwax Jacobean stain on the shelves & vanity with Waterlox to protect them from moisture. This will warm up the room a bit from all of the white/grey/chrome that is dominating this space. We’re going to go with our Delta Dryden Series Fixtures in polished chrome, just like in the rest of the house. Except in this bathroom, we’re going to do a wall-mounted faucet. I found a great deal on this rectangle vessel sink, and a wall mount faucet will allow for easy cleaning behind the sink. As always, we went with Build.com for the fixtures and plumbing parts. I always shop around and they are always the best deal. I was not paid to say that, and they don’t even know I’m writing this post. If you’ve never used them before, I highly recommend them! 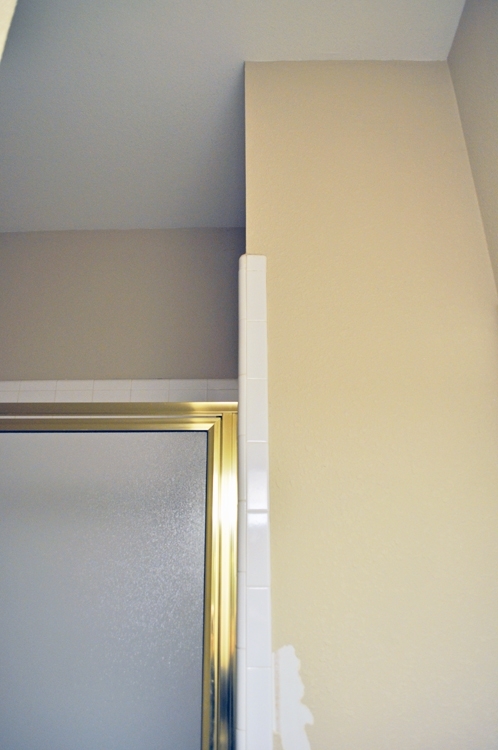 We’re going to try a Recessed Medicine Cabinet Mirror in order to get some extra storage. Those aren’t real common in this part of the country, but I like it for this small space! We’re also going to use these single sconces on each side of the mirror, instead of a downward light. I wanted the light to be more at face level instead of from overhead. 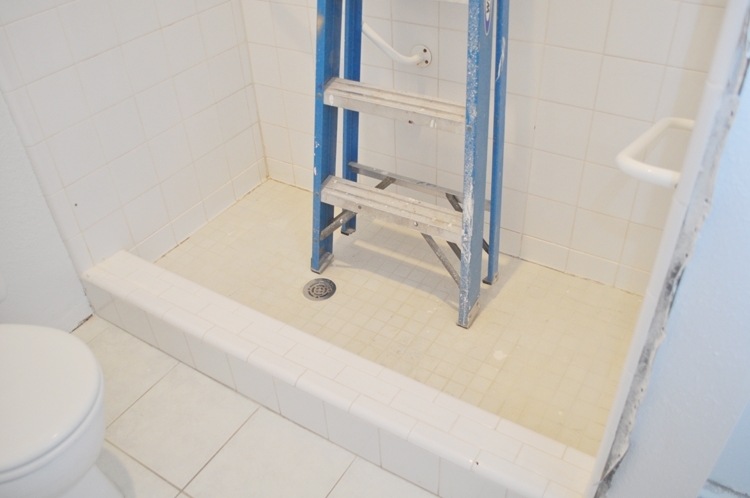 For the bathroom floor, we chose the same 1″ hexagon mosaic marble tile that we used in the Kid’s Bathroom upstairs, and this will carry into the floor of the shower, since it’s curbless. I think it will make the room look bigger. Plus, I have to bring my hexagons in here somehow. I was going to use a 4×12″ white tile for the shower walls, until I saw this handmade/organic-looking 3×8″ tile. I fell real hard for that. I’m going to need to find some pencil tile to round out the edges, but I have to have this tile. I even found an abandoned 10% off Lowe’s coupon that expires today! I’m pretty sure that’s a sign that this tile was meant to be. As far as the items that make the bathroom accessible, we’re going to use the Dryden shower system set that has the hand shower on an adjustable rod. The modern grab bars will go in here as well. I also want to find a nice teak bench that we can move around the shower. 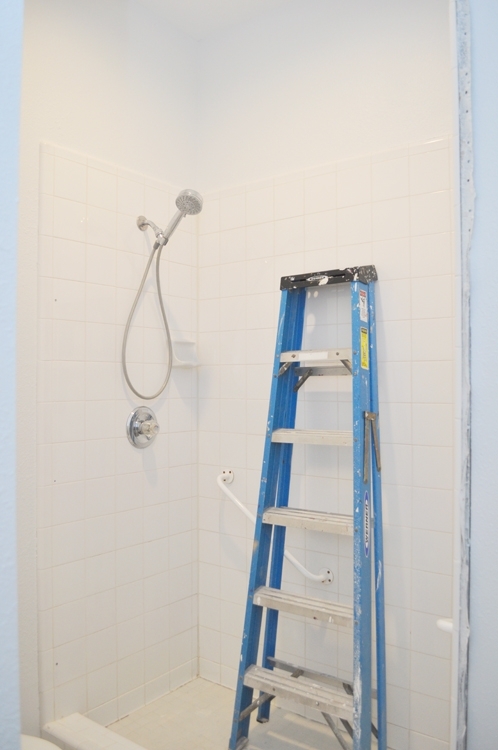 We’re going to finish the shower off with a mostly-frameless sliding glass door, maybe a barn-door? I think this bathroom is going to be amazing! It is definitely going to look totally different. I can’t wait! 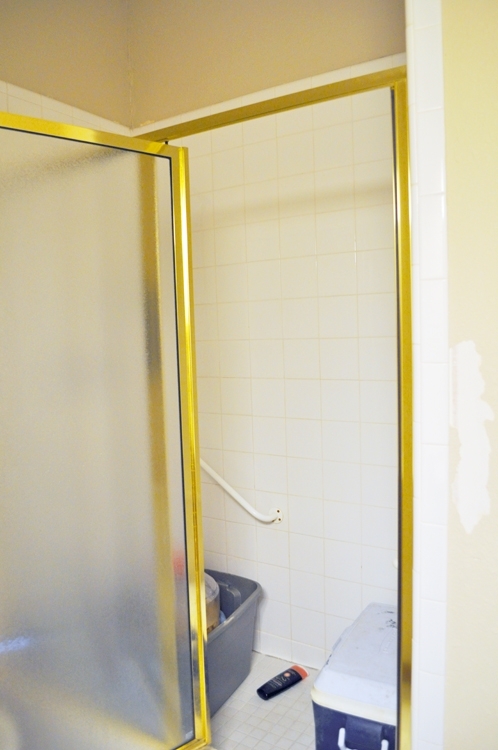 We’re going to try to remodel this bathroom for $6,000. I really don’t want to spend more than that, especially since we’re not putting cabinets or an expensive stone countertop in here. I’ve already ordered all of the fixtures and purchased the wood for the counters, and so far, we’ve spent about $2,300. I’ve estimated the tile is going to be about $1,300, and then we have to get the special shower pan, and pay for the plumber & tiler. It’s going to be tight! We purchased the wood on Sunday, but it’s been raining here for two weeks, so we haven’t been able to work on the bathroom much this last week. We’re hoping to have the vanity & shelves done by Spring Break. Then, all that’s left is the shower, floor, toilet, crown molding & trim. Keep checking in on Instagram! I’ll be posting sneak peeks here and there as we cross projects off the list! 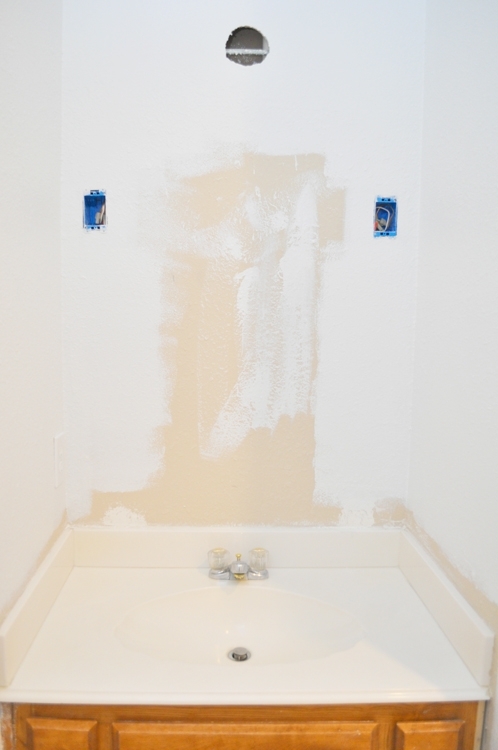 What do you think about our Guest Bathroom Remodel project? I really hate bathroom remodels because they are so dusty and dirty and inconvenient. On the other hand, they are so nice when they are done! 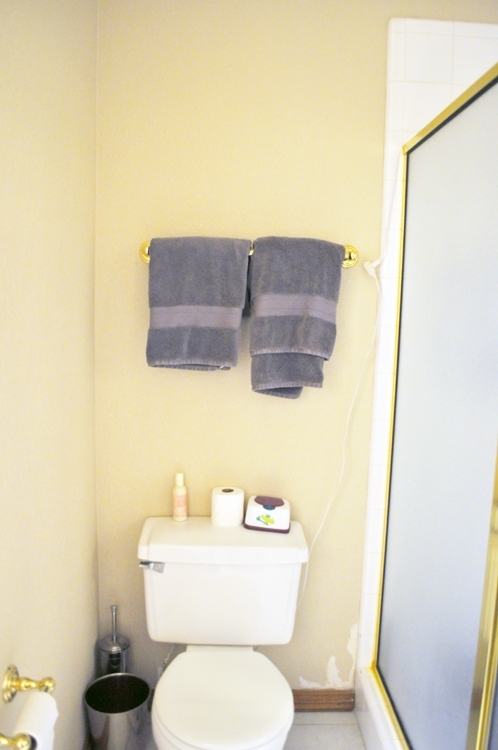 This bathroom was a total embarrassment, and it was frequently used by guests who come over to swim in the Summer. I can’t wait for it to be pretty! I feel you girl! We’re just starting our guest bathroom remodel as well – moving around plumbing, converting a tub to a shower, all new everything. It’s fun and stressful at the same time. Totally! Except the second I demo stuff, I want it all back together ASAP! LOL! I think we’re looking at middle of April before its all done. This bathroom remodel sounds great! I like how you have it all planned out and even have a budget set. 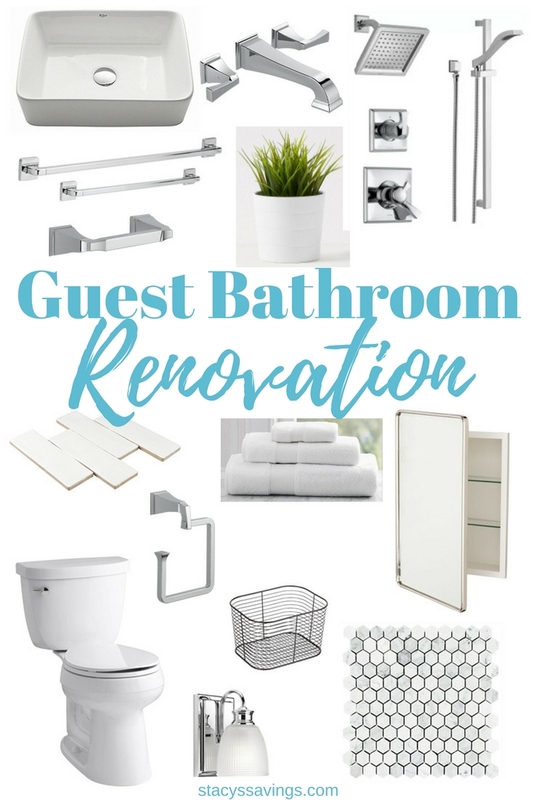 Such great ideas on changes needed for a great guest bathroom! Goodluck! Thanks! I talked with the plumber today, and I think we’re going to bust that budget. Oh well. Hopefully, not by too much! Looks great girl! Congrats on getting your new bathroom! Thank you! I’m hoping it will be done soon, but realizing it’s probably going to be May before its complete. You have it planned out so well! I love what you have picked out and I can’t wait to see the finished product!!! That is such a fun project! I cannot wait to see the new bathroom when the remodel is done!